Placing a North Arrow in a rotated view such as a plan and profile sheet can be done right the first time if you use AccuDraw and the shortcut keyins for compass rotation “T” for Top and “V” for View. One you have selected the north arrow cell to be placed the arrow is oriented straight up with the orientation of your rotated view. As shown below. To get the north arrow to rotate the direction north use the AccuDraw shortcut “T” for Top. This will rotate the AccuDraw compass orientation north. Then when you place the cell the first time it has the correct orientation and there is no need to rotate cell after it has been placed. 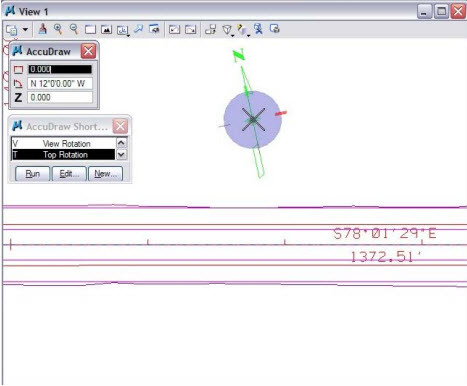 In order to get your AccuDraw compass rotated back to the view rotation use the AccuDraw shortcut “V” for view.